What's next on my list of unconventional sewing tools? An IV pole!! I went to a medical supply store and bought a used one. Yes, they thought I was crazy, but it's perfect for my needs. The hanger slides easily into the hook area and it even has wheels! From a distance, you can see that this dress would be a pain to press without someone or some thing holding it up. Since, like many of you, I work by myself, I needed help. 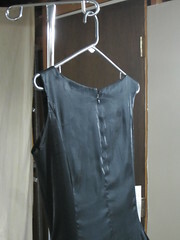 I want to hold the dress upright while pressing the skirt sections. 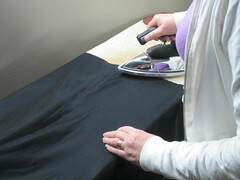 This close up view lets you see how nicely the skirt lays on the ironing board. It is free to drape down the sides a bit too, without being distorted by the weight of the dress.The dress stays off the floor, so there's no risk of dirt or threads messing up the finish. The IV pole is wonderful for several reasons. Number one, it is adjustable. 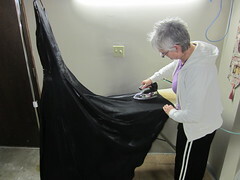 If I am pressing a wedding gown or formal I can raise it (and the dress) so that the train or skirt fits on the ironing board without dragging the rest of the dress. You can see the adjuster knob in the first photo. Here's the top of the pole. See how easy it is to hang a hanger? 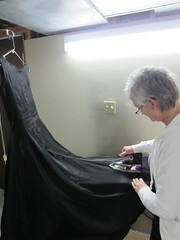 The pole will swivel on its wheels, or I switch the hanger position, as I rotate the dress around for pressing. So don't be afraid to repurpose something if it suits your needs! Necessity is the mother of invention, after all.